„MacMoragh & Muse“ has delivered an absolutely sweet little nest, it comes with 5 poses which are adjustable (comes with tree, without squirrel). It’s really very cute and will fit into any fantasy-sim or could be simply a dream station for your home. „MacMoragh & Muse“ is located at the „Magnificat“ sim @ Fantasy Fair 2013. I’m also wearing an outfit by Caverna Obscura, hair from Wasabi Pills and my makeup is by Musa. Everything is available at the Fantasy Fair. Take time to roam about the fantastic sims, they are definitely worth a visit. 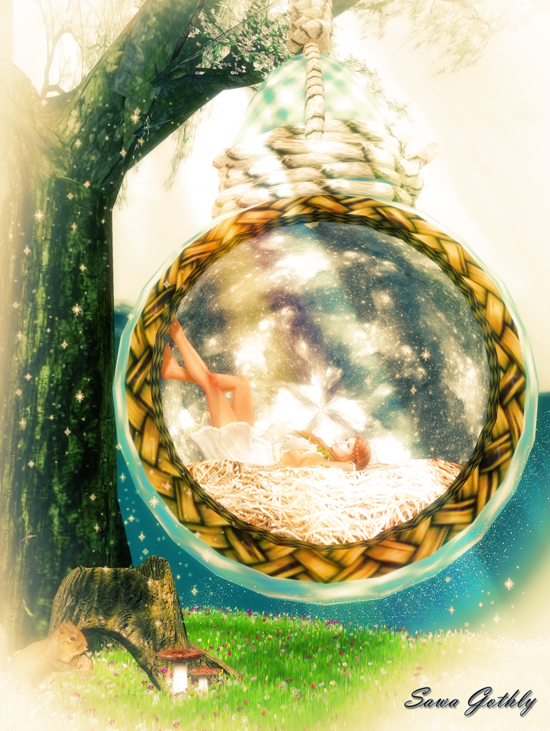 Dieser Beitrag wurde unter bloggies from Sawa, Fantasy Fair, I Heart SL, Mesh, NEW, Reviews abgelegt und mit Caverna Obscura, Fantasy Fair, MacMoragh & Muse, MUSA, Wasabi Pills verschlagwortet. Setze ein Lesezeichen auf den Permalink. ← Fantasy Fair 2013 – the SLurls !